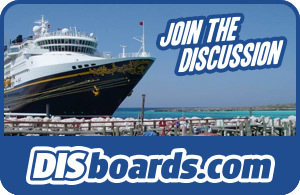 You're going on a Disney Cruise and you have a zillion questions. Relax, we have the information you need to plan ahead and have the best time on your voyage. Starting with the travel documents to the onboard activities, everything you need to know is here. What do I need to wear to dinner? What are the kids clubs like? What's there to do at the ports of call? What's the difference between the stateroom categories? The answers to these and all of your inquiries can be found through the links below. Before you begin, take a look at our Disney Cruise Vacation Planning Guide. 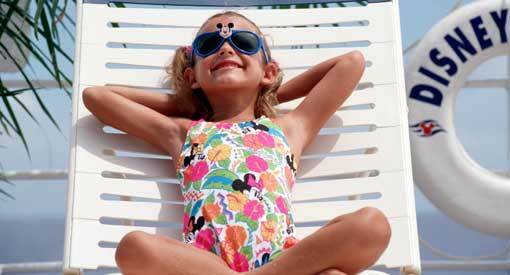 Cruising with kids may seem stressful at first (especially when you think of packing for them! ), but once you get on board, you'll all be so busy having fun that you'll forget about all of that! In fact, your kids may be so busy with their own activities, you may not see them again! We have gathered all the information you'll need so your planning will be simple. Check out our Kids Clubs page to find out hours, ages and what's available for kids. You'll find information about the ships' pools and sports decks here. Worried about having to pack all their "gear"? Disney's taken care of that for you! Strollers are available free of charge (with a $200 deposit, which will be returned when you return the stroller). There are a limited number available though, so if you want one, be sure to get there quickly! If you bring your own, an umbrella stroller might be the way to go, since it won't take up too much room in your cabin. You won't need to bring a pack-n-play either. When you book your reservation, your room will be set up with the appropriate amount of bunk beds or cribs to accommodate your entire party. Dining with kids is easy on a cruise. 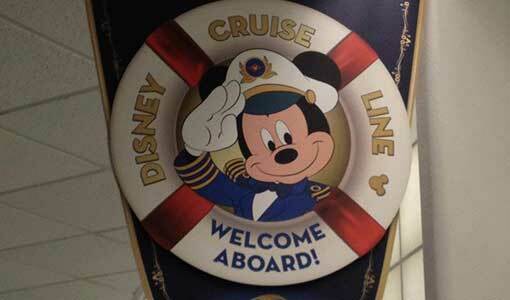 The Disney Cruise ships offer two different meal times. Main seating on the ships is at 5:45 pm and second seating is at 8:15 pm. When you make your reservation, you can request which seating you want. It may be easier to eat earlier with kids, that way you have a chance to wind down before bedtime. If you do choose the later dining time, counselors from the kid's clubs will come collect children from the dining rooms around 9:00 to head back to the clubs to play (this does not include infants). As per Disney policy, babies that are younger than 6 months old are not permitted to sail on Disney Cruise Line ships due to safety concerns. On Transatlantic, Hawaii and Panama Canal sailings, the minimum age is 1 year. If anyone traveling in your party meets these restrictions at time of sailing, please choose an alternate sail date. It's A Small World Nursery is available for kids 6 months - 3 years old. These group babysitting centers are the only option open to parents of the little ones as there is no in-room babysitting service. Unlike the planned programs for the older children, there is a charge of $9 per hour with a minimum of 2 hours. For additional children in the same family, the charge is $8 per hour. Cancellations can be made without penalty 4 hours in advance. For information on strollers and cribs, check out our Cruising with Children section. Even though they're young, babies can have fun cruising too. Check out the Mickey pool that's just for little diaper-wearing cruisers. On the Disney Dream and Fantasy, Nemo's Reef is a special water play area that will keep them entertained for hours. The Disney Magic features Nephew's Splash Zone just for kids ages 3 and under. Just keep them lathered up in sunscreen and give them lots to drink to keep them hydrated. Make sure to take lots of pictures to remember their first cruise! As per Disney policy, women who are entering their 24th week of pregnancy are not permitted to sail on Disney Cruise Line ships due to safety concerns. If anyone traveling in your party meets these restrictions at time of sailing, please choose an alternate sail date. If lines are long to board the ship, play the pregnancy card! You can only use it for 9 months, so take advantage and ask if there’s any way to bypass the lines, or at least sit while your traveling partners wait in line for you. Make sure you’re comfortable (as comfortable as you can be with a basketball for a belly!). Make sure to ask for extra pillows to put under your feet, under your belly, or wherever you need a little extra support. Just because you’re on a cruise, don’t give up on your healthy pregnancy diet. You should be able to find plenty of fruits and vegetables on the ship. Don’t completely deprive yourself though; you can still hit that dessert buffet, just do it in moderation! Make sure to keep up your water intake as well. Be prepared to combat seasickness. As most pregnant women know, nausea is nothing new. Even if you’re over this part of your pregnancy, make sure to be prepared for it to come back due to the ship’s motion. Bring whatever relief worked for you, such as ginger tablets, Sea Bands, or crackers. Remember, you may not be able to take the normal remedies you would get from the ship's doctor. See our section on motion sickness for more ideas. Use sunscreen! This should be a must anyway, but your skin may be even more sensitive to the sun while pregnant, so you will want to use a higher SPF than normal. Watch your balance. With the changes in your body, your balance may be a little off. Add this to the ship's natural motion and you may not be able to handle your normal high heels on formal night! Many people find with the airlines restricting the amount of luggage you can have it is easier and cheaper to send a box of your items to the cruise ship. It is a great way to save room and weight in your luggage when you ship a box containing your Pirate costumes, diapers and baby supplies, snorkel gear, beach toys, etc. Before you ship anything, please be aware of the guidelines below. One box per stateroom, no exceptions. The package must have the guest's full name, ship, sailing date, stateroom number or GTY if you have not been assigned a stateroom number. The package also must have a packing slip attached to the outside of the box that details the contents of the package. For prescriptions, a copy of the prescription is sufficient. Your list may or may not be read but it must have one. Write packing slip on the outside of the envelope. NO FOODS/DRINKS OF ANY KIND, LIQUOR OF ANY KIND, FIREARMS, ETC. Items that cannot be shipped to the Disney Cruise Line Warehouse and delivered to the ship include: food products (any and all food products including baby food/formula), beverages (liquor, water, etc. ), chemicals, and luggage. These items will not be accepted at the warehouse and will be returned. The required size of the cartons you are shipping down have to be about the size of a record storage box 12 inches on a side and should not weigh more than 20 pounds. Packages should be shipped to arrive a full business day before your sailing. If your box is hit on by the screening dog or chosen for additional screening they will open the list and the box and look through it. They will close it back up and provided nothing forbidden is in it, then it will be in your room as usual after boarding. These boxes will be coming on the ship with the crew mail among other things so they may be in the staterooms later than the rest of your luggage. If you tend to get motion sick you may want to book a room mid-ship and on a lower deck as you will not feel the motion of the ship as much as a room in the front (forward) or in the back (aft). If you think you are prone to motion sickness there are a number of remedies you should bring with you on the cruise. You should try them before you cruise to find one that will work for you. Bonine and Dramamine are over the counter products that don’t require a prescription. Dramamine does have a tendency to make you drowsy. If you find out you are sensitive to motion sickness while onboard the ship, you can visit the ship's doctor. They will have sea sick tablets outside their office. You should start to take them before the ship starts to move if possible. Sea Bands are another product that you wear on your wrists that help combat motion sickness. Ginger also works for motion sickness. It can come in many forms such as tea, capsules, or crackers. You can also get a prescription for a patch from your doctor to place behind your ear that may help. Get plenty of sleep before you cruise. Coca Cola will help ease an upset stomach. Don’t eat greasy or acidic foods as they tend to upset the stomach. If your stomach is starting to feel queasy, stand up and look out to the horizon. That seems to help. Don’t stay out in the sun too long. If you are overheated it could make you more sensitive to motion sickness. If you are going to have alcoholic beverages, it tends to dehydrate you. You should also drink water every 3rd drink or so. Tipping is a topic that seems to confuse guests. It is customary to tip certain positions on any cruise ship. Your room steward, your server, your assistant server and the dining room manager are all positions that would normally be tipped. On embarkation day, guests' folios will automatically be charged for the suggested gratuity amounts for Server, Assistant Server, Head Server and Stateroom Host/Hostess. Guests can still add pre-paid gratuities at the time of booking or when making their final payments. If this isn't done, a letter will be given at check-in explaining the automatic gratuity payments. Modifications to the amount can still be made at the Guest Services Desk. Please be advised that the Guest services line will be much longer on the last night of the cruise. Many guests wait till the last minute before settling their stateroom account. While tipping is not mandatory, we are certain that you will feel strongly that these people have done everything they can in order to ensure your enjoyment of your cruise. It is also customary to tip the room service people separately as they are not usually part of the dining room staff. You also might want to tip the folks in the kid’s clubs…especially if they have bonded with your child or gone above and beyond in some way (The counselors are required to pool the tips to use towards a group event, so if you would prefer, you can give an individual counselor candy or other snack items). Everyone on the ship must attend a mandatory lifeboat safety drill prior to the ship leaving port. This drill lets you know what to do and where to go should there be an emergency on board. Life jackets are in the stateroom’s closet, but if you need extra ones or different sizes, ask your stateroom host. When the announcement is made over the loudspeaker, head to deck 4 and your assigned lifeboat drill station (shown on the back of your stateroom door). You do NOT need to wear your life jacket during the drill. Crew members will be stationed throughout the ship to help you find your assigned location. Once there, the crew members will mark down your room number and do a roll call to make sure everyone on the ship is accounted for. Once this is done, you’re free to go! Elevators are stopped a few minutes prior to the start of the drill. If you are traveling with someone needing assistance or who is traveling in a wheelchair, it is best to arrive early. After the drill, elevator service will resume, but the elevators will be very crowded. Waiting a few extra minutes will make a big difference in finding an available elevator. When you check in for your Disney Cruise everyone in your room will receive a Key to the World Card. The card will function as your room key and charging card on the ship. It will show your dining rotation. It is also used to identify adults vs minors for the purpose of restricting alcohol consumption. You don't need cash while you're on the cruise ship, everything you purchase on the ship and Castaway Cay will be charged to your Key to the World Card. This includes beverage services, spa, salon services, photography, medical, laundry services, as well as any purchases from the retail shops. You can arrange that your children do not have charging privileges on their card. Once your cruise is over, you will be spoiled by the Key to the World card. It is so easy to just hand over your key for charging on the cruise. You will be asked for your signature at check-in authorizing any charges. You will also be asked for a credit card (Visa, Mastercard, American Express, Discover, Diners Club International, Japanese Credit Bureau, or Disney Visa). All your charges must be settled before you debark the ship by cash, traveler's checks, Disney dollars or the credit cards mentioned above. Don't wait until the last night to check your bill or make a payment on your account, you will find long lines. You might want to check your bill daily to make sure that the amounts are correct if you have done any shopping that day. You will want to have money with you in the different ports. Most places in the Bahamas and Caribbean will take U.S. dollars and major credit cards. For Mediterranean and European cruises it is a good idea to bring traveler's checks to exchange for local currency. There are 3 laundry rooms available on the ship. The price is $2.00 for a wash or dry cycle. Detergent and fabric softeneris also available for purchase. There are irons and ironing boards in these rooms as well. All equipment uses only the Key to the World card! You may also pay to have your laundry done for you. Dry cleaning is available with prices ranging from $3.50 for a shirt, to $7.00 for a suit. If you just need something pressed, the cost is 50% of the dry cleaning price. If you should get ill while on your vacation, you can visit the ship's medical staff. There is a physician and nurse on staff 24 hours a day for basic medical needs. Even though these services are available, they can be very costly. If you need assistance during hours that the clinic is closed, the doctor or nurse will have to be paged. The purchase of trip insurance could offset costs for medical services while onboard the ship, but it won't work like your standard HMO. You will be expected to pay the full amount, then submit a claim to insurance for reimbursement. Some personal health insurance does cover costs while onboard so check with your health insurance provider before you travel to see if yours is one of them. If your child gets sick with fever, vomiting, diarrhea, rash or other possibly contagious symptoms, they may not be able to participate in activities in the Kids Clubs. This staff is not employed by the Disney Cruise Line. Standard fees will apply.